RUFFLED PINK PERFECTION (Dan Trimmer) Tetraploid (Wild Cherry Roundup x Frank Smith Sdlg - (Dakar x Tetra Grace Pierce x Vintners Treasure) 27" EM Re Ev. 6" When I first started to use converted diploids in my tetraploid program this flower was my dream! 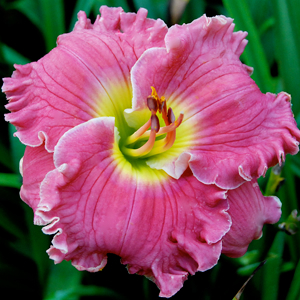 We now have truly exotic double edges and larger blooms but the extremely wide chubby sepals and round diploidesque ruffled petals on RUFFLED PINK PERFECTION do so resemble the very best of our more elegant diploids. I wish I had a more representative image but photography is not my strong suit. Garden named “Chubby” RUFFLED PINK PERFECTION’S clean rose pink blooms were much admired last year. It is fertile.